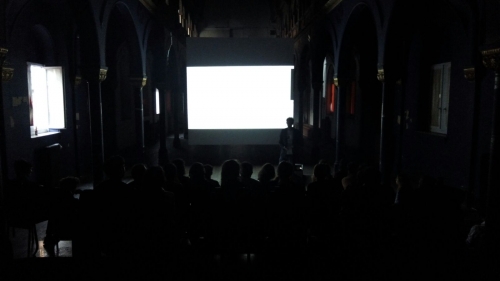 Last september, director Charles Habib-Drouot invaded Greylight’s chapel, to shoot a fiction film, The Believers. That 38 minutes long movie was shot with a tiny crew made of 4 actors and 2 technicians. Set in a city of Brussels, destroyed by unclear « massacres », it tells the story of 3 women, who hide in a deserted chapel, and try to forget their fear. On June 26th, at 21:00, the movie is presented for the first time – on the Chapel screen, in the same spot where it was shot. A perfect occasion to discover it, and have drinks in the courtyard after.